Businesses across the Humber have reinforced vital trade links with Denmark during a visit to the region by the Danish Ambassador to the UK. Ambassador Claus Grube praised the “dynamic business development” he witnessed during the visit and spoke positively about the prospects of building on the already strong links between the Humber and Denmark. The visit comes against a backdrop of huge investment in the offshore wind industry which is underlining the importance of trade between Danish businesses and those on the Humber and opening up new business opportunities. The Ambassador’s visit included a tour of DFDS Seaways’ facilities at Immingham; a reception hosted by the Bondholders marketing organisation at the offices on Hull Marina of specialist engineering business Spencer Group; and a dinner attended by Bondholder companies at the acclaimed Winteringham Fields restaurant in North Lincolnshire. The Bondholders events were arranged by Danish-born Peter Aarosin, who is Chair of the Bondholders and also a director and shareholder in several companies that operate in ports and logistics within the Humber, including RMS Group, Danbrit Shipping, the leading abnormal cargo shipping company and EastTrans. Mr Aarosin said: “It was an honour for the Bondholders to host the Danish Ambassador, supported by embassy staff and the Danish-UK Chamber of Commerce. “The UK is one of Denmark’s longest-established and largest trading partners. Ports, logistics, farming and fishing have been the traditional trading areas and now the rapid growth of renewables is acting as a powerful catalyst for a range of joint ventures and shared investments, both in Denmark and on the Humber. Ambassador Grube said Danish-owned companies such as DONG Energy and DFDS Seaways were key players in the Humber and leading the way in the region’s exciting resurgence. He added: “My visit to the Humber estuary has given me a very good impression of the dynamic business development which has taken place over the past decade. Sean Potter, Managing Director of DFDS Seaways Plc, which has been a member of the Danish-UK Chamber of Commerce for many years, said: “The Ambassador’s visit was an excellent opportunity to continue to build upon the very strong relationship that the Humber has with Denmark, of which DFDS plays a very important part. The dinner was also attended by Martin Green, Chief Executive of Hull UK City of Culture 2017, which has forged an alliance with Aarhus in Denmark, the European Capital of Culture 2017. AAK (UK): AAK, previously known as AarhusKarlshamn, is a Swedish-Danish company and one of the world’s leading manufacturers of value-added vegetable oils. Its Hull site is one of the most comprehensive edible oil facilities in Europe. Associated British Ports (ABP): ABP is the UK’s leading ports group, handling approximately a quarter of the country’s seaborne trade. ABP’s Humber facilities offer customers close links to markets in mainland Europe and Scandinavia and expertise in a broad range of cargoes. Boston Energy: Based in Beverley, East Yorkshire, Boston Energy provides experienced wind turbine technicians for offshore and onshore installations. Its clients include Siemens, DONG Energy, Centrica and GE Power and the company plans to expand into Denmark and other Scandinavian markets. Danbrit Shipping: For over 20 years Goole-based Danbrit has transported cargo and provided a variety of specialist logistics services to organisations worldwide. DFDS Seaways Plc: Part of the DFDS Group, based in Copenhagen, which provides shipping and transport services in Europe to over 8,000 freight customers, including on its Immingham to Copenhagen route. DONG Energy UK: DONG Energy is the world leader in offshore wind. Headquartered in Denmark, it has around 6,500 employees, including nearly 600 in the UK. Construction and commissioning of DONG’s Westermost Rough offshore wind farm has been managed from Grimsby. EastTrans: Operating from Stallingborough, North East Lincolnshire, EastTrans provides a comprehensive logistical service to companies throughout the UK and the near continent. Eimskip UK: An international shipping and logistics company with its UK head office in Immingham and operations in Denmark. Earlier this year Eimskip entered a strategic partnership to become the largest third-party logistics provider in Aarhus. Humberside International Airport: The second biggest heliport in the UK, the airport plays a crucial role in transporting crews to the North Sea oil and gas platforms and the rapidly-growing offshore wind installations. Neill & Brown Global Logistics: A well-established logistics provider with more than 200,000 sq ft of warehouse space and cargo handling and distribution facilities over two sites within the Humber. Denmark is one of the company’s key European markets. Pattesons Glass: Based in Grimsby, Pattesons Glass supplies glass jars and bottles to some of the leading manufacturers within the food and beverage industries, including AAK and Lakeland. Pattesons is working with UK Trade & Investment to export to Denmark and Sweden. PD Ports: Operating at five locations in the Humber, PD Ports provides a wide range of supply chain solutions such as stevedoring, transport, warehousing and freight services. Rix Shipping: Hull-based Rix Shipping’s businesses include Rix Sea Shuttle, which operates crew transfer vessels serving offshore wind farms. RMS Group: Operating out of of seven terminals around the Humber, RMS handles in excess of two million tonnes of cargo annually and offers a complete port logistics service. Seafox Management Consultants: Seafox, which has offices in Grimsby and Norway, specialises in securing funding and grants for businesses, business planning supply chain analysis, international sales and business development support. Spencer Group: A Hull-based engineering business specialising in delivering logistically complex schemes in sectors such as rail and energy. Spencer is delivering the world’s largest retro-fit cable dehumidification project to prevent corrosion of the main cables on Denmark’s East Bridge, the third largest suspension bridge in the world. Windpower Support: A Grimsby-based company providing a range of specialist services for the UK’s offshore wind industry. 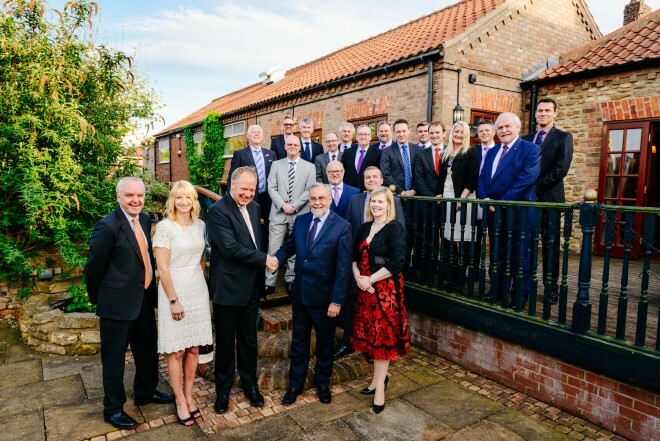 Founder and Managing Director Kurt Christensen is the Honorary Danish Consul for Lincolnshire. The Bondholders is a fast-growing, private-sector led group of 280 member companies and other organisations that act as ambassadors for the Humber to encourage investment and job creation.